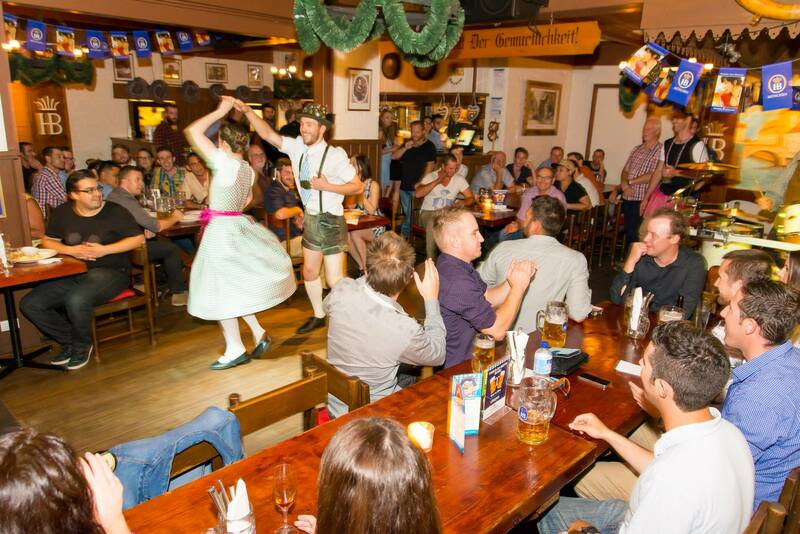 The Hofbräuhaus is the perfect venue for your next Bucks Party, Birthday Party – in fact any celebration you may have! Your guests will remember your event and talk about it for years to come as they experience an atmosphere steeped in the traditions of the true Bavaria. We proudly present three areas available for functions in our Melbourne German restaurant: ‘The Bier Hall‘, ‘The Restaurant‘ and ‘The Alpine Bar‘ – all authentically designed to create memories of a lifetime. The Bier Hall seats up to 130 and is open every Friday and Saturday night, and is also available for weekday private functions depending on function size and requirements. The space is fantastic for parties that are after a lively atmosphere, such as a Bucks party or birthday event. With authentic and fun shared long benches, the upstairs Bier Hall is a great space for your next event. The Restaurant can cater to a sit-down dinner or corporate lunch suitable for a wide range of guest numbers, large or small. The space is a little more intimate, with private tables and traditional furnishings – the main restaurant is a pleasant space for various event types. The Alpine Bar is perfect for a warm and cozy cocktail function for smaller groups, or excellent pre-drinks space before moving to your designated table for your next function. A jovial, lively atmosphere, the space is never short of fun. There are a variety of catering options on offer from as little at $32.50pp for two courses! Also on offer are our very popular sharing platters – offering all the very best German food menu items for guests to sample and share. Have guests with dietary requirements? No problem – we will do our very best to accommodate. No matter what your choice, your guests will enjoy our haus-made Bavarian foods prepared to family recipes, guaranteed to satisfy your taste buds and your appetite. Traditional live music complements the whole package – playing every Thursday, Friday, Saturday and Sunday nights. We welcome Hens, Bucks, 21sts, Birthdays, Anniversaries, Corporate Events and any other special occasions.